High performance remote control of PXI systems possible with PXIe-8301 remote control module using Thunderbolt 3 ports. National Instruments (NI) has announced the PXIe-8301 remote control module, the industry’s first product for laptop control of PXI systems using Thunderbolt 3. The PXIe-8301 offers PCI Express Gen 3 connectivity through two Thunderbolt 3 ports to maximise performance and delivers up to 2.3 GB/s of sustained data throughput. Engineers can use the second port to daisy chain additional Thunderbolt 3 or USB-C devices. 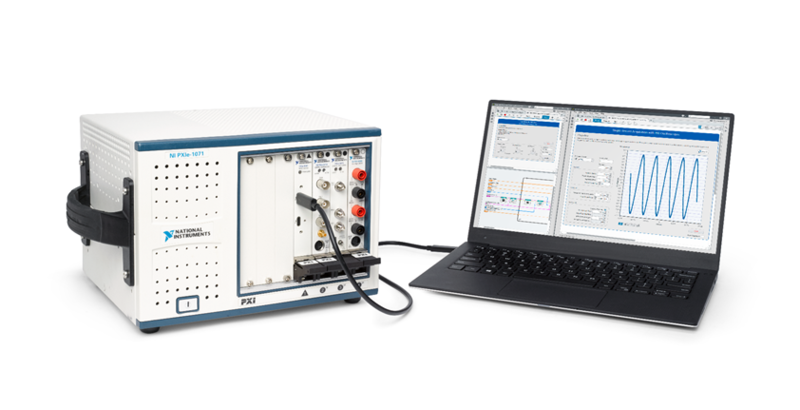 With its modern connectivity and low price, the PXIe-8301 makes high-performance control of PXI systems more accessible and affordable to engineers performing benchtop characterisation and validation or developing portable automated test systems. The PXIe-8301 extends NI’s portfolio for low-cost PXI control, which includes the recently released embedded PXI Controller, the PXIe-8821. The PXIe-8821 is optimised for test and measurement applications, featuring a 2.6 GHz Intel Core i3-4110E dual-core processor and providing up to 2 GB/s system bandwidth. With their industrial ratings, small physical footprint and managed life cycles, embedded controllers are ideal for long-life PXI deployments into harsh operating environments. Remote control modules and embedded controllers are an important part of the NI platform and wider network that engineers can use to build smarter test systems. These test systems benefit from more than 600 PXI products ranging from DC to mmWave and feature high-throughput data movement using PCI Express bus interfaces and sub-nanosecond synchronisation with integrated timing and triggering. Supported by a vibrant network of partners, add-on IP and applications engineers, the NI platform helps to dramatically lower the cost of test, reduce time to market and future-proof testers for tomorrow’s challenging requirements.